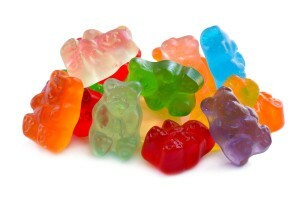 Gummy candy is one of the top selling confections in the United States. It was first developed in Germany in the 1920s. Worldwide distribution came about in the 1980s. The original gummy candy was made in the shape of a bear. There are many more gummy designs available today. We offer a gummy animal mix, gummy bears, fish, butterflies, and worms. Animals shapes are not the only the only forms of this candy that are available. We also have gummy rings in apple, cherry and peach flavor. Red raspberry gummies are a unique, fun, flavorful gummy candy. In addition to diverse gummy shapes, you can also select varieties such as the traditional sweet treat, a sour version of this delightfully fun candy or the sugar-free variety. There’s more than one reason to buy wholesale gummy candy. First of all, it’s simply a great snack to have on hand to satisfy your sweet tooth. Secondly, it’s fat-free. It’s also a snack that can fit into a low sodium, cholesterol free diet. Thirdly, it’s a source of protein. Carbohydrates are the main energy source for the body. A serving of this chewy candy can provide 10% of your daily value of carbohydrates. Another reason to buy bulk gummy candy is that it is a practical, portable snack. When packing a lunchbox or backpack with candy gummy candies are an ideal choice. They won’t break apart or melt like some candy will. The main ingredient in gummy candy is gelatin. Gelatin is flavorless. Therefore, sweeteners and flavorings must be added to the gelatin to create this tasty treat that people have fallen in love with. The gelatin plays a significant role in determining the texture of this candy. 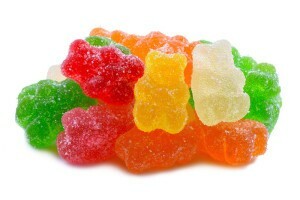 Various types of sweeteners such as sucrose, fructose, corn syrup and sorbitol are used in gummy candy. Sweeteners add flavor and function as a preservative. Natural and artificial flavors are used to give gummy candy the delightful, diverse flavors that kids and adults expect when they bite into one of these chewy gems. 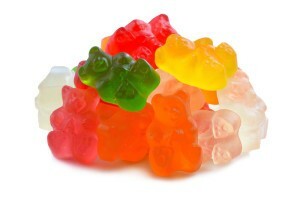 Acids such as citric acid and lactic acid are often added to further intensify the flavor of gummy candy. Among the many varieties of candy, gummy candy is without a doubt one of the most colorful types of candy. As previously mentioned, gelatin is the main ingredient in gummies. In its natural state, gelatin is a pale yellow color. Manufacturers use federally regulated dyes to give gummy candy the brilliant, vibrant colors that make gummy candy store displays eye-catching and irresistible. The manufacturing process for gummies is quite detailed. It begins with a procedure called compounding. After the compounding process is finished, the mixture is transferred to a starch molding machine known as a Mogul. The candy undergoes a starch removal process. The gummy candy falls into a vibrating metal screen known as a sieve, then onto a conveyor belt and ultimately into trays. The candy is then manually transferred to other machines where they are decorated and packaged. A gummy candy store display is sure to capture the interest of most children. Adults also find that section of a store too enticing to ignore. Diabetics and dieters don’t have to be deprived of the fun and flavor that a gummy treat has to offer. Sugar-free gummy candy can excite your taste buds just as much as the sweetened variety. When you’re planning a party, buying wholesale gummy candy is a budget friendly way to decorate the party table and create party favors. Buying some sugar-free gummies to package up for children who can’t eat sugary snacks assures that everyone gets to enjoy this popular treat. Sugar-free gummy bears and butterflies make a colorful topping for cupcakes or ice cream. You don’t need high-level decorating skills to create a beautiful birthday cake using gummy candy. Whether you’re doing some serious dieting, trying to maintain a specific weight or simply being cautious about the fat content of the snacks you eat, sugar-free gummies can be one of your go-to snacks when you need an energizing treat. You don’t have to do battle with yourself over whether to struggle through a snack attack or eat a little treat when you have a few gummy treats nearby. Their chewy texture can often bring the satisfaction you need to carry you through to mealtime. Not all snack cravings involve a sweet treat. When it comes to sour candy gummy bears and gummy worms rank high on the list of satisfying treats. You might want to buy bulk gummies to have as an alternative to sweet treats. Sour gummy candy is a great way to awaken your taste buds. They’re a good snack to reach for when you’re experiencing an afternoon slump. College kids might find them a beneficial treat for those late night study sessions. Kids love to be adventurous with the snacks. Mixing sour and sweet gummies is something they might find enjoyable. Surprise kids or party guests by hiding some sour gummy worms in a sweet cupcake. Surprise your kids by sneaking some sour gummy bears into a scoop of ice cream or into a gelatin dessert. Just as with all other gummy candy, these sour treats can be enjoyed by the handfuls or used in many creative ways.